Oh yeah, baby, that’s right. 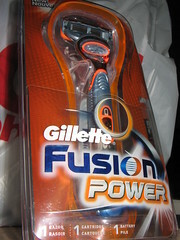 A Gillette Fusion Power razor. Five blades. Count them. Five. Blades. And battery-powered micropulses. Now I am a man. asteeeeeg! you are THE man with that blade. but, uh… do you have anything to shave? hehe! dito sa pinas, hanggang 3 pa lang ang blades. No, you’re just a latent metrosexual. Orange-coloured razors of any kind will do that. I love how Gillette disses three bladed razors in their ads for the Fusion. Basically they’re saying that if you use their Mach3 razor, you’re a giant loser (but they’re still going to sell it to you). 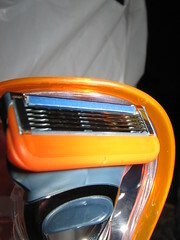 Of course, aren’t you going to look foolish when the 8 bladed razor comes out in the next product cycle.